The first page of the text informs us that it is L’image du monde, which is generally attributed to Gossuin de Metz. Of the three French redactions, the first was composed in 1246 and offered to Robert d’Artois, Louis IX’s brother. 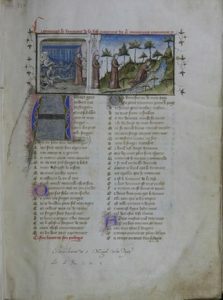 Many manuscripts of the text contain drawings such as those that are found in MS Ham 577. Just go to the wikipedia site and you will see similar ones. For more information, consult the entry on Gossuin in the Dictionnaire des Lettres françaises, pp. 555-56.